The territory of the Yukon is wintry, wild, and wonderful. Canada's True North is a spectacular wilderness of comprehensive national and territorial parks filled with stunning landscapes and rare wildlife, like the 120,000-strong Porcupine Caribou herd that is protected in the Vuntut and Ivvavik National Parks. Black and grizzly bears, Dall sheep, moose, wolves, and musk oxen are some of the other creatures spotted regularly all over the territory. 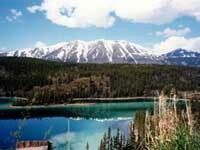 The Yukon Territory is in the extreme northwest of Canada, bordering Alaska. Its tourism is focused around outdoor activities like fishing, canoeing, kayaking and hiking in the summer, and skiing, snowboarding, ice climbing, snowmobiling, and dog sledding in the winter. The Yukon also has its own natural magical light show in winter: undulating ribbons of pale-green, pink, and blue lights dance in the night sky as the Aurora Borealis phenomenon delights watchers below. The province also boasts Canada's highest mountain set in a sea of ice: the majestic Mount Logan peak in Kluane Park. Although 80 percent of the Yukon is wilderness, there are people living there too. Native Yukoners are spirited and uniquely connected with their land, having plenty of tales to tell travellers. Many legends survive from the days of the Klondike Gold Rush in 1897, when 30,000 aspirants arrived in Dawson City in hope of making their fortunes. The First Nations culture is also well preserved and museums, historic sites, and interpretive centres throughout the province provide fascinating insights.